I’ve been slow to speak any thoughts about the tragic Sandy Hook elementary school shooting last week. The nation has heard a lot of reactions, from the President to the news media to ordinary people through the eruption of commentary on Facebook and Twitter. I’ve paid attention to some of this, agreeing with some comments and ignoring others. But internally, my thoughts keep circling back to one question: What if more people had intentionally befriended the shooter before this happened? Could simple friendship have changed anything? I’m thinking this way because friendship keeps coming up as a theme in my ministry. I’ve written elsewhere about how God gave my co-pastor and me a unique friendship through this call to plant a church together. In many ways, our church has quietly become a community where the lonely discover friendship. John V. Taylor wrote in The Go-Between God, that “every Christian group or cell should look for some way in which it can meet a genuine human need in the situation in which it is placed” (p. 150). When I read that two years ago, I scribbled in the margin a note saying “emotional needs are a genuine as physical.” The fellowship which authentic friends share is one example. Friendship doesn’t appear to be an immediate physical need for survival, but without friendship our souls slowly starve, wasting away until death comes to us – or others – as the result. Surely one manifestation of Christ’s life-giving victory over death is the community of genuine friendship which bears His name. Significantly, the most authentic friendships look outward. C. S. Lewis observes in The Four Loves that “Lovers are normally face to face, absorbed in each other; Friends, side by side, absorbed in some common interest” (p. 61). Those in the friendship of the Church stand side-by-side absorbed in their common interest in Jesus. Nowhere is this seen more clearly than at The Lord’s Supper, when the community gathers like a family to partake of one loaf and one cup, side by side, but with eyes focused upon their Savior. Accordingly, Taylor wrote that if the Church gathers in order to . . .
Next to that paragraph, in the margin of my book, I wrote “Upper Room!” Taylor’s description of intimate fellowship during Eucharist reminds me so much of how Upper Room started, celebrating communion around a coffee table in a living room, and how we continue to worship as a larger and still-expanding family. I think this is one reason why visitors to Upper Room sometimes say they can tell that we have authentic relationships with each other. We have friendship and community, not because we strive for the ideals of friendship and community, but because we focus our attention on Christ together. Like Christ, this fellowship exists not for its own sake, but for the life of the world. Christ calls us His friends (John 15:14-15), and if friends stand side by side looking at a common interest, then we’re called to stand next to Jesus and focus on the lost and broken of the world. We were enemies of God when Christ chose to befriend us, so its only fitting that in His Name we befriend even our worst enemies. Even the mentally ill. Even the potential murders. Jesus called Judas “friend”, even when Judas came to betray Him (Matthew 26:50). Throughout The Go-Between God, Taylor argues that the Holy Spirit is constantly calling us to a new awareness of God and others. That new awareness could show up in such simple ways as us humbly taking the time to listen to the person we’d never noticed before. We can’t force these friendships to develop, but if we open up to such possibilities, God may surprise us with new companions. So, let us be vigilant, especially in this season when so many feel lonely or isolated, to not let people fall through the cracks of relationships. Pray for God to show us the people we’re called to befriend. Ask the Holy Spirit to humble us and make us more aware of the significance of every person outside ourselves. If we listen, in a few weeks or months we might discover new companions next to us when we receive Communion. May God grant us the grace to do what Christ our Lord has done for us: befriend the friendless. 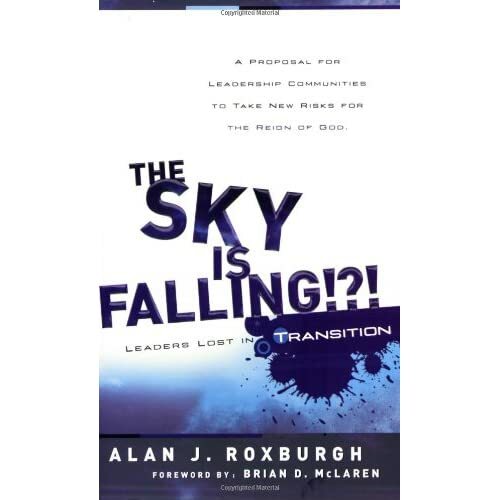 I’m headed out of town today for a Company of New Pastors retreat where we’ll be discussing Alan Roxburgh’s book The Sky is Falling. Despite being a church-planter, it’s been a while since I’ve read one of these “the world is changing and we have to become missional before the Church dies” books. As I’ve discovered the fruitfulness of reading works from the early Church, books in Roxburgh’s genre have become less appealing. But this book did have some important ideas regarding the formation of leaders for the Church in our context and the roles those leaders then fill. I want to comment on these because I find his proposal both promising and lacking. Anyone considering reading this book should know that the first nine chapters (140 pages) of the book are designed to set up the final 3 chapters (48 pages). This last section of the book is where it actually gets exciting. As for set up, here’s what you need to know: The Church in our context is in a situation of liminality – a period of change in which one is in-between two different stages or places, a prolonged time of standing in a threshold. Think of Israel wandering in the wilderness, living in-between the life they’d known in Egypt and the life they would know in the Promised Land. During such periods of liminality, the people going through this change discover a new sense of connection or bonding called communitas. If you’ve ever been on a mission trip, you know what this feels like. It’s the sense of connection that you develop with that team of people while you’re experiencing an adventure in an unfamiliar context. Roxburgh sees the Church in a period of liminality, and argues that both traditional and non-traditional leaders need to work together to create communitas in order to survive the transition. Once you get to Chapter 10, Roxburgh starts to lay out a vision for leadership in the Church which sees Christian leaders with various roles and gifts and united under the leadership of an “Abbot/Abbess”. These leaders with differing functions and spiritual gifts would ideally be trained not in modern seminary environments but through hands-on apprenticeship under masters of the faith. These ‘masters’ should be characterized less by academic credentials and more by experience, wisdom, and spiritual maturity. Ideally this is already the goal of apprenticeship programs such as The World Christian Discipleship Program. Here I agree with Roxburgh’s general observations about leadership formation. After describing some of the roles which these leaders fill – poet, prophet, pastor – Roxburgh moves on to his proposal for an office of “Abbot”. The Abbot or Abbess functions less as a manager of an organization and more as a curator of an environment. Borrowing a term from Lawrence Miller, Roxburgh calls this person a synergist, defined as “a leader with the capacity to unify diverse and divergent leadership styles around a common sense of missional vision for a specific community” (p. 155). Surprisingly to me, Roxburgh envisions the Abbot not as the leader of one congregation, but as an overseer of many various ministries and congregations. (If you have the book, see the chart on page 182 which makes this clear.) Essentially, Roxburgh is proposing having a bishop. He avoids this word, probably because of its authoritarian and institutional connotations, stressing that the Abbot is “not a denominational executive” (p. 182), but I can’t help but think that Roxburgh’s Abbot is close to what a bishop should be. This is good, and I find it particularly relevant to our own context where Pittsburgh Presbytery is implementing a new mission plan which will eventually lead to us having four “branch ministers” who could each lead just as Roxburgh envisions his Abbot or Abbess leading. Good. Promising as this is, there’s something missing in Roxburgh’s ecclesiology. And it’s something big. The problem with this book, and with so many other books on missional ecclesiology, is that it totally neglects the role of the sacraments in shaping and sustaining the life of the Church. Despite occasional suggestions that we look to our history for guidance, Roxburgh doesn’t always present an accurate reading of Church history. Contrary to the overview of early Church history in pages 148-150, the early Church did have a defined pattern of leadership in which hierarchy did not always equal bureaucracy. The office of bishop evolved very early in the life of the Church not out of captivity to our culture’s professionalism or bureaucracy, but out of a desire to ensure proper celebration of the sacraments. Ordination was practiced by the Church to set people apart for the leadership of worship, not administration. Like other similar books, Roxburgh at times reflects anachronistic projection of contemporary emergent distrust of hierarchy onto the history of the Church. The primary concern of the early Church’s first bishops wasn’t paperwork. It was a life of worship culminating in the celebration of Eucharist each week. And if that’s the primary job description of a bishop, I see no reason to fear using the word bishop. Roxburgh’s choice of the word Abbot reflects a low ecclesiology, rather than a true sense of monasticism, in which the Abbot also lives a life of worship. But this correction is no reason to abandon Roxburgh’s vision. Rather, the book’s proposal for leadership should be deepened to reflect the spirituality necessary for leadership of the Church in our context. What if the Abbot or Abbess whom Roxburgh pictures overseeing multiple congregations and ministries was primarily concerned with cultivating environments of holy and beautiful worship? What if prayer and spiritual disciplines were essential parts of the apprenticeships which prepare the leaders who serve under the Abbot? What if remembrance of our Baptismal identity and celebration of the Lord’s Supper provide the connections to the “core Christian narrative” which Roxburgh says we need to recover? That’s a vision for the Church that I find appealing. Tomorrow is the Squirrel Hill Clothing Swap! For four hours on Saturday, October 2nd, Upper Room is going to be turned into the equivalent of a thrift store. For a $3 donation to the Squirrel Hill Urban Coalition anyone can fill up a trash-bag worth of clothes from what people have donated over the past month. And there are tons of clothes available, in all styles, shapes, and sizes. It’s happening at 5828 Forward Ave. from 1 pm to 5pm. For more details see the Facebook event page. I have not been blogging much recently for one big reason: Eileen and I bought a house. For two weeks all our spare energy has gone into packing, moving, and working on the new house. It’s a wonderful house, and we’re truly blessed to have it. And in only a few days of living there I’m noticing a number of differences between renting and taking ownership. This feeling probably wears off for homeowners after a while, but everything in the house comes with a greater feeling of responsibility. When a doorknob is loose, I know I’m responsible for fixing it. Weeds in the yard, squeaks in the floor, and spots of peeling paint can’t be as easily overlooked anymore. There is no other landlord who will fix things that break. No one else is going to pay for the water-heater to be replaced. No one else is going to water the plants or cut the grass or fill the bird feeders. We were always responsible renters, but I know there were things that I’ve overlooked in other places we’ve lived thinking, “That’s not my problem,” or “Someone else will take care of that.” Not anymore. Eileen and I have ownership, and that means one big thing: responsibility. And of course I think there are parallels between these feelings and life in the church. Normally members of newer churches have a higher feeling of ownership over the ministry than in existing churches, but like home-ownership it doesn’t take long for the joy of responsibility to turn into tiredness and burnout. Friends who have been homeowners for years sometimes lament to me the amount of time, energy, and money they put into home maintenance. Sometimes they even said, “Don’t buy a house.” Responsibility and ownership sound nice, but renting is clearly easier sometimes. I think church “renters” are a perennial presence in all congregations. They stay in one place for a short period of time, not putting down the roots that it takes to build deep community. And they give less time, energy, and money to the maintenance of the community because they’re not rooted there. But no church community will survive without people taking ownership. Someone has to claim responsibility for the maintenance, especially with the less glorious and more painstaking tasks of ownership. I love the windows in our new house, but I do not look forward to scraping and repainting every window frame. So this raises questions for me: How can churches cultivate attitudes of church-ownership rather than “renting”? How can we help people find joy in the responsibility of belonging to a church community? Well, to extend the analogy, why do people by houses? I think rootedness plays a role. 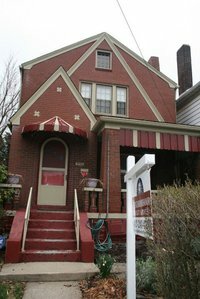 Eileen and I decided to buy a house because it became apparent that we were becoming rooted in and committed to Pittsburgh for the next several years. Perhaps people take ownership in a church when they see the benefits of being rooted in one community over the long-haul. The opportunity to take control was also a factor in our decision to buy a house. We wanted the freedom to garden as we chose and to have a dog. But we couldn’t have those freedoms and privileges without increased responsibility. Likewise, if people want to help shape a church culture, they have to take on the extra work that it takes to do so. One more reason a lot of real estate is purchased for the sake of investment. Generally speaking, it’s good stewardship to buy rather than rent. Owners have something tangible to show for the money they pay toward their housing, while renters give that money away. And, if the conditions are right, in time the value of the property increases and there is a return on the initial investment. For a church member to invest a church community means taking on more responsibility, but it also means a greater return on what’s given. Relationships that last over years and years provide more return that short-lived and shallow ones. Seeing hearts turned toward Christ and signs of his Kingdom coming in a changed neighborhood is the return investment in a new faith community. Eileen and I don’t know all our neighbors yet, we don’t know what the coming years will bring on our block, and we don’t know what other curve-balls God may throw at us in the meantime. But we’re committed, so we chose to buy rather than rent. And I have hope that in the end it will be worth it. I pray God will grant our church community the same graces of ownership. I’m so thankful for this life. I was blessed with such a great life. I hate how often I find myself whining incessantly, yearning for something different. I love where I am in life and who I’m with and what my purpose is. I wish I would have come to this realization earlier so I would have shared it with more people. Suicide should never be an option and I’m disgusted that I ever thought it could be my escape. I love life. I LOVE LIFE! I love life, and I love you! Thank you. Thank you God for blessing me with life. How amazing is this?! First of all, praise God that this person found the joy in life in that moment to want to stay alive. It reminds me of the Kate Hurley song “Tree Branch”. In the song, she describes the depression she feels when looking at a blooming tree and realizing that it doesn’t move her as it once did. Then she sings “I’ll tie a rope and make a swing, and I’ll fly high and wide. I’ll laugh and throw my head back, and choose to be alive.” Whether s/he knows it or not, I believe this note about choosing to be alive , left on a random magazine cover, is a testimony to new life in Christ. Second of all, notice how anonymous the message is: There’s no reference to anyone by name, place, or even gender. As Eileen pointed out, it’s a bit like PostSecret, a random confession, written in a medium accessible to strangers, but (perhaps) not in a way that’s accessible to a person’s most intimate relationships. Perhaps this person felt the need to express that joy, but how much richer would it have been if expressed into community? Who will celebrate with this person? Who will confirm that it is God who loves and sustains them?